As Mark parachutes into enemy territory, the cold air stings my face. Everything that could go wrong in this attempted extraction of kidnapped medicos, does: everything. Louis Nowra’s descriptions of the action are so vivid I feel I’m in the thick of it. Mark, the only survivor, staggers under the burden of losing his closest friend. Injured and in a remote mountainous part of Afghanistan with no communication, Mark wonders if he has the will or the ability to survive. Then he finds his friend’s dog, deafened from the blasts of battle. 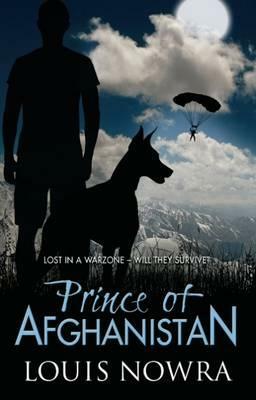 With no one but his mate’s dog as company, Mark must adapt to his harsh surroundings or die. At first he thinks Prince is a liability, but Prince has skills Mark never imagined possible. The bond that forms between soldiers and their military-trained dogs is unfathomable but Louis Nowra succeeds in helping us understand why. Based on in depth research, Nowra’s tale gives us a fictional account of Mark, Prince and their growing bond from its inception. While filled with action and danger, Prince of Afghanistan is so much more than a war story.